You lead a dynamic organization. How well does your organization make, communicate, and track decisions? Benchmark your business across seven critical decision practices. 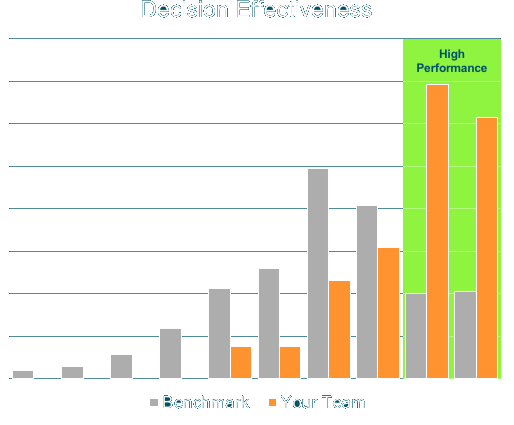 Compare your organization to performance benchmarks. Diagnose the challenges holding your team back. Target the highest impact improvements. The assessment takes just 5 to 10 minutes for managers and leaders across your organization to complete. Your insights and recommendations will be ready within two weeks. The assessment is available to qualified potential customers of the Cloverpop platform. Are decisions made too slowly, with too many meetings? Are people left out of the loop? Are people willing to disagree and commit? Do bad decisions stick around too long? Your assessment will also include targeted recommendations for high impact improvement.